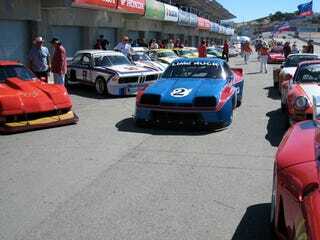 In our estimation, the two finest cards of the day at the Monterey Historics fell on Sunday — the resurrection of the Canadian-American Challenge Cup and the retro IMSA class (aka Group 7b in Historics parlance) are the two wish-we'd-been-there, can't-miss events of the weekend. And since commenter jrhmobile requested pics of the DeKon Monzas, we're happy to oblige him, especially considering this particular car, driven by Chad Raynal of San Jose, decimated a field consisting of insanely-turbocharged Porsche 935s, a few RSRs and even a wound-out Ford Capri, whose driver John Norman was one of the ballsiest, hooniest men of the weekend. The three DeKons in the contest all ended up in the top ten, but here're a few photos of the winning Monza shot while we were entering a pleasant haze courtesy of eight internally-combusting cylinders and a heaping helping of race gas. Enjoy the pre-race gallery; on-track action shall follow.